The Guardian Life Insurance Company of America is over 150 years old and one of the largest mutual life insurance companies in the United States. A key to its long-term success has been keeping its clients’ needs central to all aspects of its business practices. When the company began to implement e-delivery of customer communications and transactional notices, reinforcing this strong commitment to its policyholders with a reliable user experience was a paramount consideration. After evaluating e-delivery options, Guardian Life selected SparkPost, citing its superb delivery to the inbox, ability to generate individually personalized messages in real-time, and seamless integration with the company’s Exstream customer communications management (CCM) platform. Native integration with Exstream and flexible options for expansion with SparkPost’s API. Real-time reporting for immediate redirection of failed messages to alternate channels, ensuring regulatory delivery compliance. Personal and proactive support from SparkPost Technical Account Managers and the dedicated deliverability team. 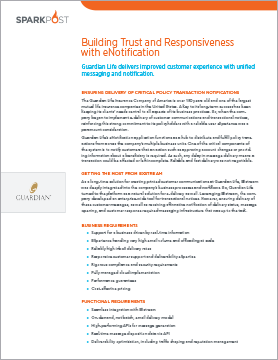 Download this case study today to learn more about how Guardian Life works with SparkPost to ensure that transactional notifications are a reliable part of its customer-facing business processes.